It’s an unfortunate fact that one in four pregnancies will end in a miscarriage, typically within the first 12 weeks of pregnancy. In most cases, this will be a single, one-off event with the underlying biological cause unknown. However, around 1% of couples will suffer the agony that is recurrent miscarriage. Recurrent miscarriage is typically defined as the loss of three or more pregnancies in a row. As the mother carries the pregnancy, the traditional belief has been that the underlying cause of miscarriage resides with her. But maternal factors such as hormone imbalance or an inability for the womb to support the pregnancy only account for about half of recurrent miscarriages. It’s clear, then, that other unknown factors apart from maternal health play a significant role in miscarriage risk. This lack of understanding has lead researchers to investigate whether the quality of a father’s sperm may be involved. Before becoming pregnant, many women will assess and modify their current lifestyle choices, for example drinking or smoking less, in order to ensure a healthy pregnancy. But the health of the father at the time of conception is one factor that is often overlooked. We now know that the quality of a man’s sperm is directly linked to his health. Excessive alcohol consumption, smoking, stress – and even the type of underpants he wears – can all affect the quality of a man’s sperm. One of the biggest factors affecting sperm quality is obesity. In many countries, while rates of obesity have been increasing, male fertility has been declining. Studies in both men and mice show that sperm from overweight males are less motile, are less likely to fertilise an egg and are less likely result in a healthy birth. The prime goal of sperm is to fertilise the egg and pass on the father’s genes to the next generation. It is therefore essential that the DNA contained within the sperm is not damaged or fragmented. Studies have shown that factors such as poor diet, being overweight, smoking, infection and pollution all increase how fragmented the DNA is within sperm. As sperm cannot repair their damaged DNA, high levels of sperm DNA fragmentation is viewed as a leading cause of infertility in men. 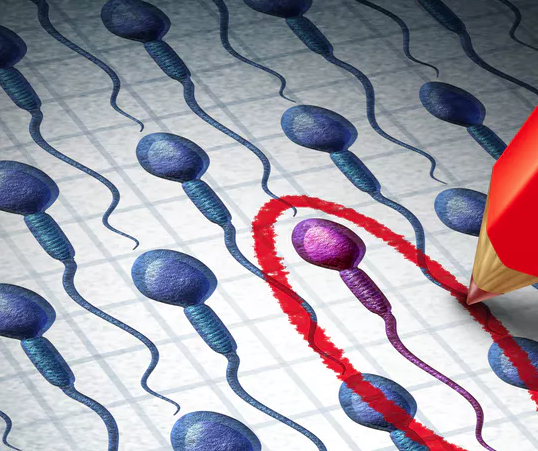 Researchers now believe that high levels of sperm DNA fragmentation are also linked with increased risk of miscarriage and a recent study demonstrated a link between sperm DNA fragmentation and recurrent miscarriage. Excessive alcohol consumption, smoking, stress – and even the type of underpants he wears – can all affect the quality of a man’s sperm. Researchers from Imperial College London studied the quality of sperm in men whose partners had suffered with recurrent miscarriage. They then compared those sperm with sperm from men whose partners had not experienced miscarriage. They saw that sperm DNA fragmentation levels were twice as high in men whose partners suffered with recurrent miscarriage than in the control group. The researchers also found that the levels of a group of molecules called “reactive oxygen species” were four times higher in men with DNA damaged sperm. Reactive oxygen species are produced naturally by every cell, and small amounts are necessary for male reproduction. However, at higher concentrations, reactive oxygen species can damage sperm cells and their DNA. The researchers also noted that the men whose partners suffered from recurrent miscarriage were also heavier than the control men as well as older. Recently, there has been a lot of interest in the relationship between a father’s age, the quality of his sperm and the health of his offspring. As men produce sperm throughout their lifetime, the belief has been that age does not affect a man’s fertility. However, recent studies have suggested that a father’s age at the time of conception might affect the health of his children. The link between a male’s health and well-being of a male and the quality of his sperm is now well established. It is also becoming apparent that sperm quality influences a range of factors including a man’s fertility, the likelihood of him becoming a father and even the long-term health of his children. However, more research is needed to understand the links between the health of a father, the quality of his sperm and the well-being of his offspring. Much of the fundamental research to date has been conducted in animals. As such, it is vital that we now establish whether the same effects are seen in humans. What is clear though is that both prospective parents in couples who intend on becoming parents should assess their current lifestyle habits to maximise their chances of a healthy pregnancy.